Contax RTS is an SLR 35mm film camera, manufactured by Yashica and introduced in 1975. In the early 1970s, production of Zeiss Ikon cameras had ceased but the desire to build a high-quality system using Zeiss lenses remained. In 1973 the Contax name was licensed to the Japanese maker Yashica to create a prestigious brand of 35mm cameras and interchangeable lenses in cooperation with the German company. By that time, Yashica was a production giant with considerable electronic camera experience, and was seeking ways to expand sales and improve brand name recognition in the highly competitive 35mm SLR market. Thus began ‘Top Secret Project 130’, a collaboration with Carl Zeiss to produce a new, professional 35mm SLR with an electronically-controlled shutter, bearing the Contax brand name, along with a new line of premium quality lenses. The F. Alexander Porsche Group was hired to complete an ergonomic and styling study of the new camera. The result was the all-new Contax RTS, which appeared at Photokina in 1974, and proved an immediate hit. The RTS featured an electronically-controlled, horizontal cloth focal plane shutter with speeds of 1 - 1/2000 sec. plus B, interchangeable focus screens, and the ability to accept a number of professional accessories including power winders, professional motor drives, and both infrared and radio-controlled remote releases. Before being replaced by the RTS II, an interesting variant of the RTS was produced in small quantities: the Contax RTS Fundus (also called Scientific/Medical). This was essentially an RTS with two additional features. Firstly, below the shutter speed dial on the front of the top-plate, a locking button was added that prevented the dial from being accidentally knocked from its X-sync (1/60) and Auto settings. The second change was even more useful: the celebrated electronic shutter release of the RTS was incredibly sensitive with a depression of less than 1mm to activate the shutter but in a laboratory, for example, where you may be wearing gloves, accidental firing of a standard RTS was a problem. Contax solved this by modifying the top plate further and adding a 2mm guard ring around the shutter release button. Most - but not all - of the RTS Fundus cameras had 'Scientific/Medical' stencilled in white on the base plate. A very small number of these bodies also featured additional mirror-damping. Since the advent of the RTS, Contax cameras have been made by Yashica in Japan, with lenses made by Carl Zeiss - some in Germany, some in Japan by Yashica (later Kyocera). The cameras were noteworthy for their advanced electronics. The Contax Zeiss T* lenses, in particular, soon gained a reputation for superb optical quality. Since manual-focus Contax and Yashica manual-focus 35mm SLR cameras share the same common bayonet lens mount, their lenses may be used interchangeably. The success of the RTS led to other Contax cameras (see Contax (Yashica/Kyocera)). In the Contax model range, the most professional and most expensive body would always have a name beginning with RTS. 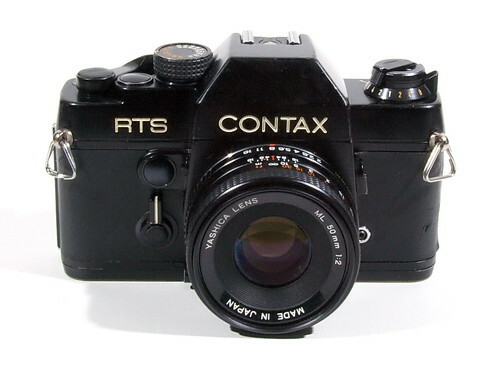 In 1982 the original RTS was replaced by the Contax RTS II. 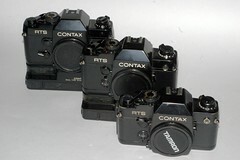 In 1991 the RTS II was replaced by the Contax RTS III. Lens mount: Contax/Yashica mount. Does not make use of MM lens shutter priority. There are several Zeiss and Yashica lenses for the camera. Shutter speeds: Auto mode - 4-1/2000 Manual mode - 14 settings of 4-1/2000 +B. Exposure meter: TTL center-weighted metering at full aperture using SPD (silicon photo diode). EV range -1-19 at ASA 100. Exposure setting: set the shutter speed Auto or manual, then press continuously the exposure check front button over the self-timer lever, a red LED dot appears in the right of the speeds index, automatic setting of the shutter speed corresponding the number in the index, if a second LED dot appears automatic setting of shutter speed is between the numbers on the index; In manual speeds mode if the red dot is over or under the setting of yours, the exposure is not correct, you must correct it by turning aperture ring or speeds dial; Indeed, there is a line of 16-dot LED parallel to speeds index. Exposure compensation: +2 EV ~ -2 EV , via exposure compensation dial beneath the ASA setting: 1/2 stop clicks using unusual system of x4 to x1/4. X4 means "times 4" or 2 stops. Speed scale with a pointer on the right side. Green pointer overlaps "A" setting on Auto; or indicates shutter setting on manual. Back cover: Hinged, removable, opens by pulling film rewind knob all the way out. Battery: 6.2v silver-oxide battery (544 or PX28), or 6v alkaline-manganese 4LR44.